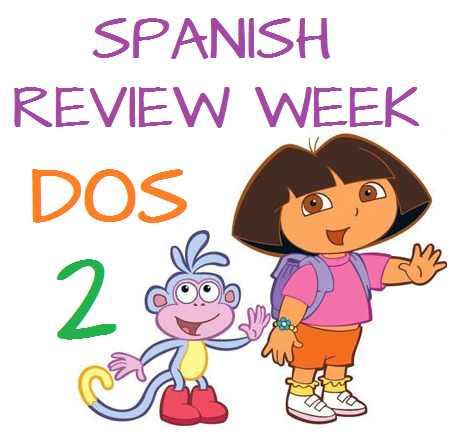 “Spanish Review Week DOS” is next! Believe it or not, the 2011-2012 PPA school year is nearly coming to a close! With the entire alphabet behind them, the students moved on to another area of focus throughout the year – Spanish class! Spanish Review Week was scheduled for not UNO (one) but DOS (two) weeks! Taking on one of the eight units of study each day of the week, the students sure were busy reviewing all of the concepts and vocabulary discussed throughout the entire year! Read on below to learn about the work that was done and fun that was had during Spanish Review Week Uno (one). Since school was closed on Monday for the observation of Memorial Day, the students returned to school on Tuesday with TONS of Spanish shares. The students brought in different animales, Spanish instruments such as castanets and maracas, as well as various foods like queso (cheese) or pan (bread). Of course, everyone’s favorite Spanish speaking cartoon characters, Dora and Diego, also made appearances in the share box throughout the week! By far the most exciting share of the week was the one shown below – a singing/dancing Chihuahua! Watch below – do you know this song? Before diving into their morning work, the students started their Spanish Review activities in stations by playing assorted Spanish activity games with PPA Spanish teachers, Miss Beverly and Miss Patty. Whether it was a Spanish matching activity game or Simon Dice (Simon Says), the students had a blast! For their morning work on Tuesday, the students reviewed the first Spanish unit covered during the school year – Spanish Greetings! Of particular focus were the Spanish words for Hello and Goodbye. Do you know how to say Hello and Goodbye in Spanish? If you said “Hola and Adiós”, then you are correct! To help remember these important greetings, the students created the following art project. 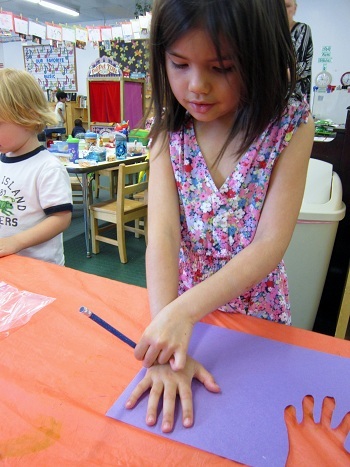 First, they selected a colored paper on which to trace their handprint. 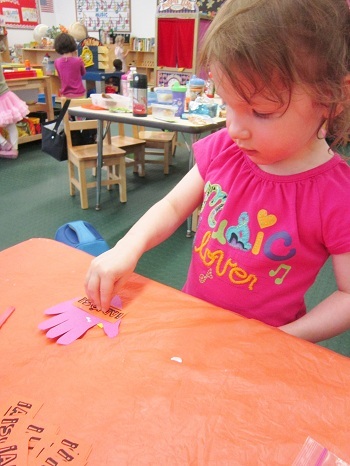 Once the handprint was traced, it was quickly cut out and labeled with an “Hola” and an “Adiós”. Here is how the completed project turned out (or at least the Hola side). During the afternoon, the students had a group Spanish lesson where they discussed and practiced saying some additional greetings including Gracias (thank you) and De nada (you’re welcome). 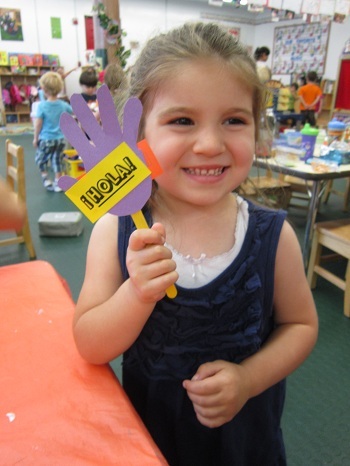 They particularly loved watching their Hola/Adiós hands come to life during the singing of the Hola and Adiós Songs. What a fun day! On Wednesday, the students moved on to Unit Dos (two) of Spanish class – Los Numeros (Numbers). 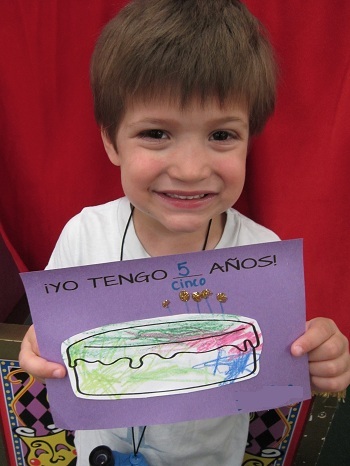 To help them review this concept, the teachers asked the following question – “?Cuántos años tienes?” or “How old are you?” For their morning work, the students decorated and “lit” the candles on their very own birthday cake! Of course since they were reviewing los numeros (numbers), the students were asked to answer the question with the appropriate number for their age. Here is how the finalized project turned out. 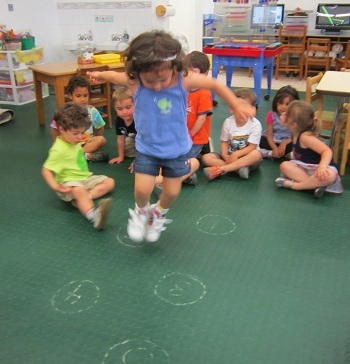 During the afternoon, the students got moving around as the classroom was transformed into a hopscotch jumping ground full of numeros (numbers). Watch below to see the students in action! 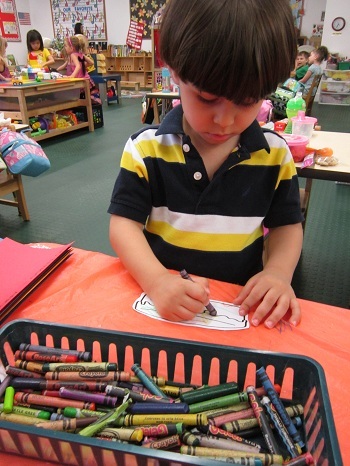 Thursday’s unit of focus was Los Colores (colors) and what better way to review the color vocabulary than art! 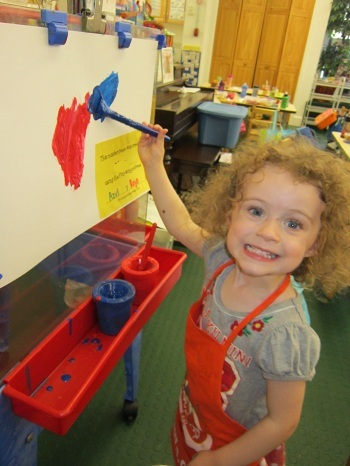 Dressed in artist smocks, the students selected dos colores (two colors) to paint a masterpiece with! 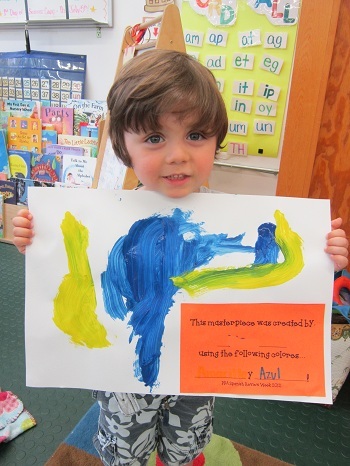 Take a look at this student’s artwork; can you name the colores (colors) this student chose? If you said, “Azul (Blue) and Amarillo (Yellow)” then you are correct! During the afternoon on Thursday, the students participated in a schoolwide art show where they had a turn to walk around the classroom PPA Art Gallery and view all of the student artwork! The students enjoyed viewing their classmate’s artwork and describing their own. Things were really cooking on Friday as the students reviewed the Yummiest Spanish unit of all – La Comida (food). 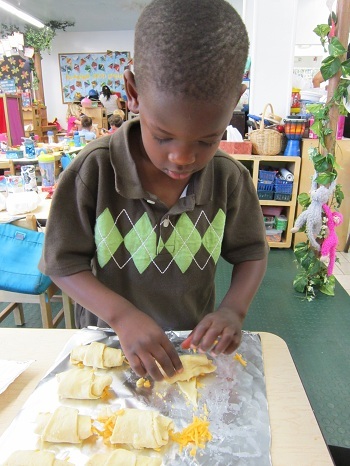 Taking the following two vocabulary words Pan (bread) and Queso (cheese), the students prepared and baked a yummy snack to enjoy later in the day – Pan de Queso or Cheesey Bread! Look below to see one student in action! Yummy! 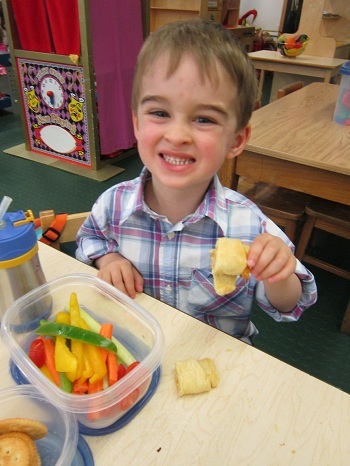 The students certainly enjoyed their delicious homemade treat! What a sensational week “Spanish Review Week Uno (One)” turned out to be! We can hardly wait to see how much more learning and fun takes place during “Spanish Review Week Dos (Two)”. Be sure to check back next weekend for all the details. As always, thank you for reading and have a fun and safe weekend! Attendance is limited to the PPA student and his/her Daddy.